Greece’s far-right radical party Golden Dawn is expected to come third in the parliamentary election. The anti-immigrant party with Nazi roots is showing remarkable staying power, despite most of its members and lawmakers facing criminal charges. News of Golden Dawn’s all-but-official success comes as the far-left Syriza and the Independent Greeks parties, which came in first and second, reached an agreement on the formation of a coalition government. Golden Dawn has secured its place in the parliament with over 6 percent of votes. If victorious, they’ll be contributing 18 MPs to the 300-member parliament. Leader Nikolaos Mihaloliakos and several senior figures in the party are either behind bars or under house arrest. Mihaloliakos posted a congratulatory recorded message for his party colleagues, saying “we achieved this great victory despite the fact that we could not be guaranteed an equal and so-called democratic election as the regime likes to call it, shunned by all (media), facing mudslinging and slander from all sides ... having to campaign through a payphone. We have a fresh mandate ... everyone fought to keep Golden Dawn away and they lost. Golden Dawn won." Such popularity is not new for the far-right. Its parties in general have been sweeping EU polls and increasing their representation in the European Parliament. They hold 52 seats, which is 15 more as compared to the 2009 vote. This takes place as rampant anti-immigrant violence grips Greek streets amid a steep rise in the radicalization of poor disenfranchised youths, as the EU’s stringent austerity policies take greater effect. However, the party also gained prominence by providing the poor with social services in these difficult times for Greece. 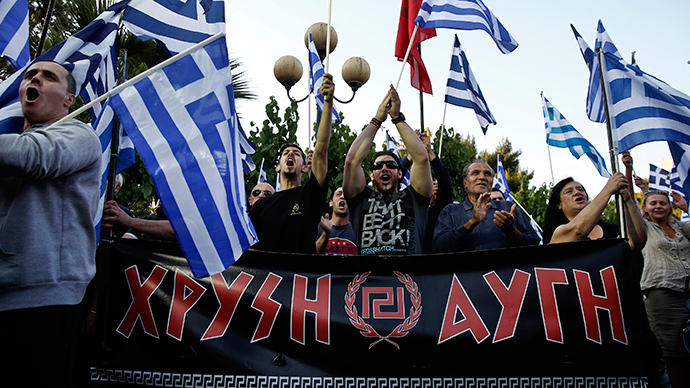 Their countrymen worry that Golden Dawn is no longer a collection of atomized, angry individuals. Their numbers show a rising political movement with a solid agenda. This is despite the many things that could have hurt the party, like the string of criminal allegations and accusations of violence by street gangs that follow the ideology.